This isn’t strictly letterpress related but does concern print making so perhaps not completely inappropriate. 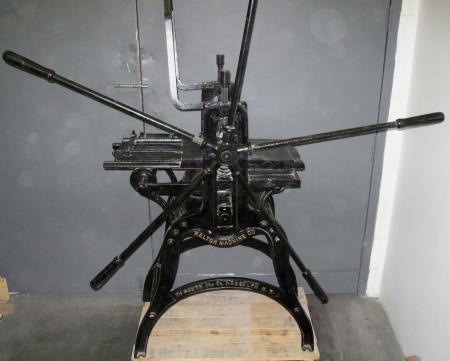 I’m looking for any information I can find on an M. M. Kelton intaglio/etching/copperplate/engraving press (choose your nomenclature), a photo of which can be seen below. I know presses this old (second half of the 19th century) rarely had manuals or instructions but catalog pages can be especially helpful as they usually give very full descriptions, specifications, and sometimes even basic operating info. Also, the date of the catalog can help. But anything relating to the press could be useful. Anyway, any info at all would be greatly appreciated. If anyone is currently using one of these presses I’d also like to hear from you. Nice engraving press, I’ve got a very similar one in the garage waiting for assembly. There is a bit of information on Kelton on the internet, including an entry in the New York Times May 11, 1890 where their roof-top fresh water tank at 124 Baxter St. overflowed and flooded the shop. I suspect our machines are from the same time frame. By the way (from your web site) Rosback still supplies pins for their perforators (at least until a few years ago), they emphasize to get the size and diameter correct as there are apparently hundreds of variations. Thanks for responding. That’s an interesting NYTs reference. I just about finished restoration on the press this weekend. There was quite a bit to clean up since the bare metal surfaces had gotten a coat of stubborn rust on them at one time or another. The first people to get the thing after this wanted it for display and covered everything over: rust, dirt, grease, etc. with black paint. The next people to get it wanted it for a lobby that never materialized and I got it next. It also needed a few pieces repaired but was surprisingly complete with the exception of one of the hand wheel arms; I’m making one of those out of some iron bar stock I have. The previous owners had used a wooden substitute. So now all the surfaces such as the rollers and top of the bed that should be bare metal are bare again. The bearings are clean and oiled, etc. I was so excited to get so far I did a really down, dirty and terrible job of making two prints. In spite of doing everything wrong, the press worked great. I’ll be posting details on my blog. I had gotten in touch with Rosback and sent them a couple of my pins to match. They have what I need and at a very good price, but you must buy 500 at a time and even at their good price it ads up by the time you get that many. So I’m saving up and will hopefully get to replace all of mine within a few months. What size pin did you end up with? I have a Rosback table-top model that needs pins. By the way, my engraving press is missing a handle too. It was a barn find, I’m thinking of not refinishing it. The paint is a weathered grey look, and the arms have some sort of early rubber handles on them.